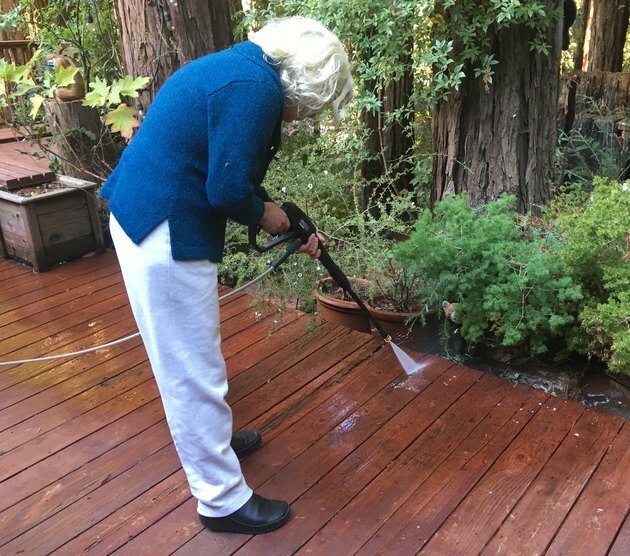 Keep mold and mildew under control by power washing your deck regularly. Power washing is a great way to get your deck ready for a new finish, but even if the deck doesn't need paint, an occasional power wash is a good thing. It keeps mold under control and, if the deck is unfinished, it brings back the natural color of the wood. You don't need to rent a heavy-duty gas-powered machine -- inexpensive electric power washers do a perfectly acceptable job, and they are easier and safer to use. 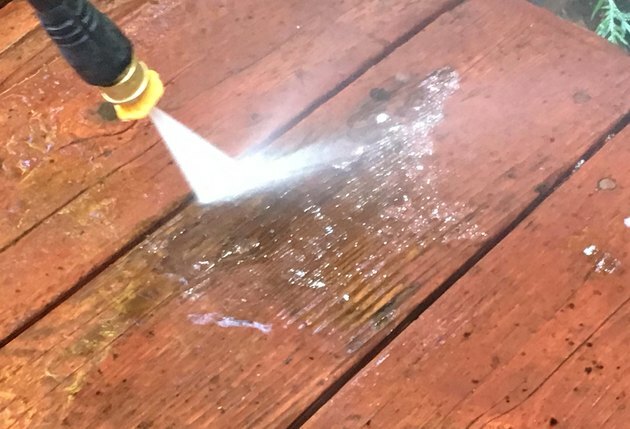 It takes the better part of an afternoon to power wash a moderately sized deck, and you'll get exceptional results if you follow a simple step-by-step procedure. 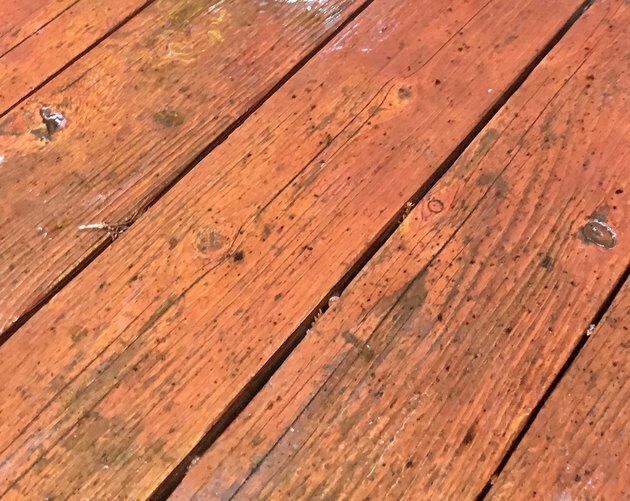 Renting a power washer might seem like a good idea, considering you might never use it again after washing the deck. However, you can buy a new electric machine for less than twice the amount it costs to rent a gas-powered one, and an electric power washer is easy to store and comes in handy for other jobs, such as washing the car, outdoor furniture or the siding on the house. 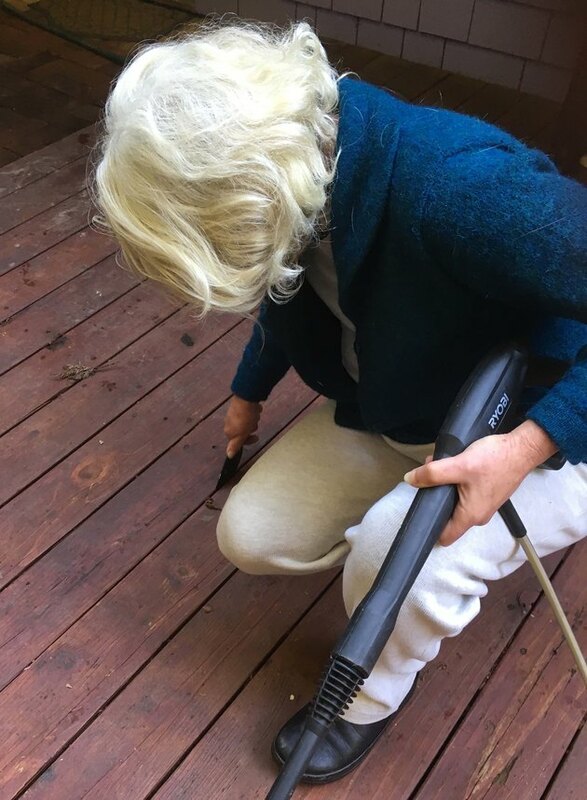 An electric power washer capable of developing 1,600 psi is powerful enough to clean most decks, and because lower pressure is less likely to splinter and gouge wooden decking boards, an electric machine is actually safer than a gas-powered one. Don't hesitate to go for more power if you need to strip the finish from your decking boards, though. Scooping out leaves and sticks from between the boards improves drainage and forestalls rot. Sweep all loose debris off the deck with a broom, then clear the gaps between boards with a paint scraper or putty knife. This is a good time to check for rot and replace deteriorated boards. Most power washers have a soap reservoir. 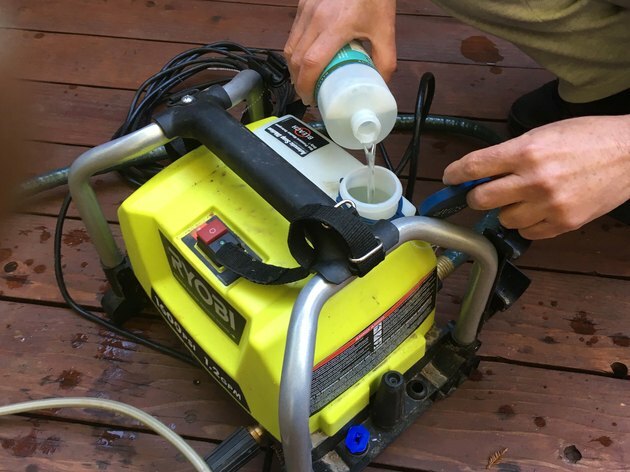 Fill the soap reservoir in the power washer with deck detergent. Although bleach is an effective mold killer, it may deteriorate the rubber seals in the power washer, so avoid it if the manual proscribes it. Plug in the power washer, connect a garden hose, turn on the water and install the soap tip that came with the power washer on the wand. The soap tip is usually the blue one, but check the manual to be sure. Spray the soap solution over the entire deck and let it sit for about 30 minutes. If your power washer doesn't have a soap reservoir, mix a detergent solution in a bucket and spread it with a push broom. Most power washers come with a selection of high-pressure nozzles. Black or Blue -- Low pressure for soaping; 65-degree spray pattern. White -- Low pressure for general cleaning; 40-degree spray pattern. Green -- Medium pressure for lifting dirt; 25-degree spray pattern. Yellow -- Medium to high pressure for deep cleaning; 15-degree spray pattern. Red -- High pressure for blasting; 0-degree spray pattern. 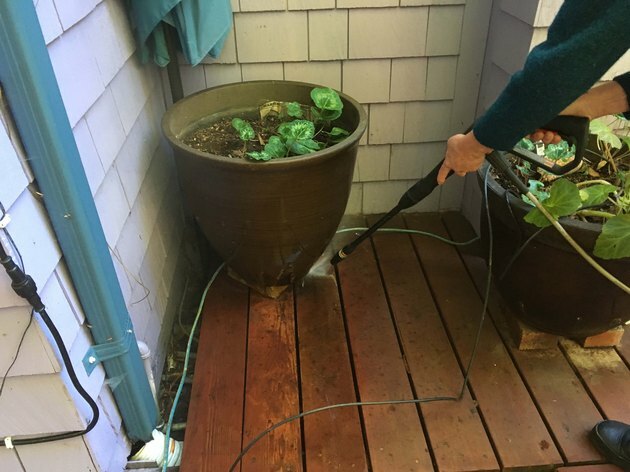 You primarily need the green and yellow nozzles when power washing a wood deck. You'll never need the red one, which is only for metal and concrete, so put that one away to avoid accidentally using it and damaging your deck. Use the black or blue nozzle for soaping and the white one to clear debris and loose dirt. Some power washers come with a turbo nozzle, which is shaped differently than the others. This nozzle combines the blasting power of a red tip with the lifting ability of a green one. Its jet, which rotates at a speed between 1,800 and 3,000 rpm, softens the blast and makes this nozzle the most useful one for deep cleaning. It's best to clean each board completely before moving on to the next. Wash each board individually, working from one end to the other, before moving onto the next one. This technique prevents overlap marks, which are lighter areas that have been washed more than once. You don't have to move all the way from one end of the deck to the other, which may be impractical if you have a long deck. Just stop at the joints between boards before going back to the starting point. The nozzle should never be closer to the wood than about 2 inches. Maintain the nozzle at an average distance of 6 inches from the deck. You can get closer when necessary to remove stuck paint or tree sap, but never get closer than about 2 inches. At close range, the yellow or turbo nozzle can gouge wood or leave track marks that are difficult to remove. A final pass with a low-pressure nozzle clears the deck of lingering debris. Remove the high pressure nozzle and replace it with a general-cleaning nozzle (preferably the white one) and give the deck a final once-over. 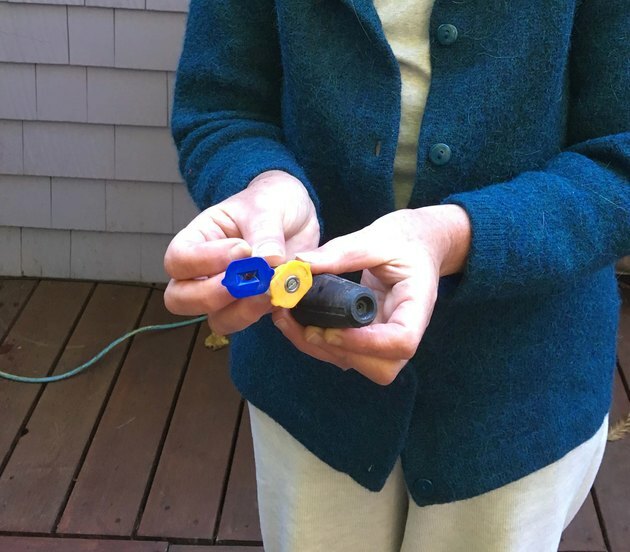 Keep the nozzle at least 12 inches from deck to force paint chips and any other debris you loosened with the high-pressure nozzle completely off the deck. 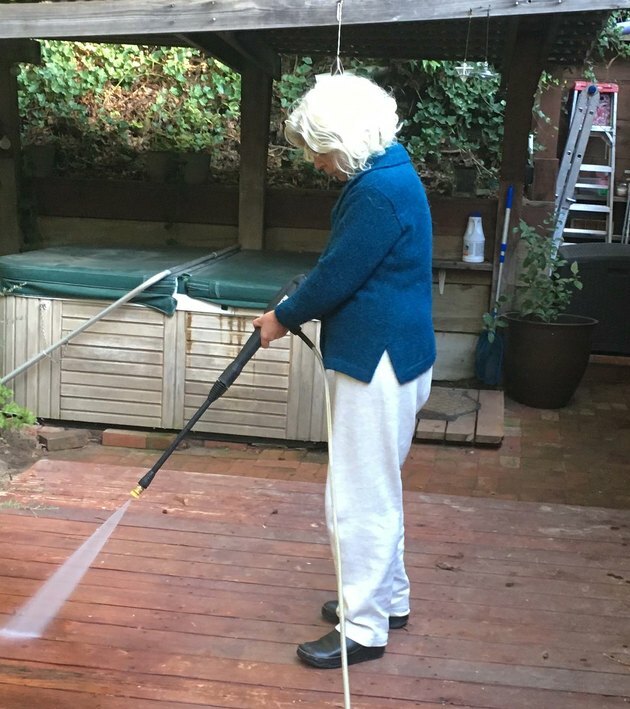 It could take days for your deck to dry after power washing. Wait for the wood to dry completely, which may take from 1 to 3 days -- depending on the weather -- if you're planning to coat the deck with paint, stain or a waterproof finish. You'll know the deck is dry when all the boards achieve a uniform color several shades lighter than they were when they were wet.